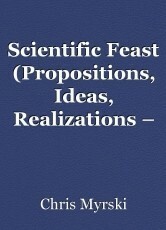 This is a motley folder with various kinds of my scientific, as well also popular, ideas, propositions, and realizations, which are, as a rule, translated from the corresponding Russian folder, noting that in Russian the word "mir" means exactly a feast, big eating, so that they are meant as food for the brain. They are divided here in three part, where in the first part are etymological and similar questions (about a world alphabet, etymology of numbers, and world transliteration with Latin chars), which are pretty specialized, then in the second are programmer ideas and realizations plus one enumeration of various PIR ideas outside this PIR folder, and in the third are some ideas for the society (about law and justice, with mathematical calculations), business and banks, as also about new calendar. What Other PIR Ideas Are There Outside The PIR?